Nora Gallagher is a reporter and a writer. Personally, I don't think she was the best choice to write about this topic in this series ("The Ancient Practices"), but that wasn't for me to decide! Having read three of the eight books in the series, I think I have figured out that editor (Phyllis Tickle) has asked the authors to include reference to all three Abrahamic faiths: Judaism, Christianity, and Islam. That's fine, but it does require a slight modification for certain practices, like changing "The Lord's Supper" to "The Sacred Meal." I guess you could call this being "religiously correct." The topic at hand is hardly trivial. It's the thank-you meal ("eucharist") that Jesus instituted at the Last Supper when he told his disciples, "Do this in remembrance of me." And so they (we) have done so ever since. Or, as Gallagher says, "[T]his odd, mysterious, ritualized eating and drinking...has been a part of the fabric of this faith in all probability since its inception" (xviii). First the criticisms and then on to the decent observations I think she made. One problem is her attempt to equate the Lord's Supper with a soup kitchen. She mostly restricts this to chapter 10, but references are present throughout the book. Another problem is that she seems to equate activism with faith (see especially page 36). As for positives, she recognizes that, "[Communion] is meant to be done together; it has to be done in community. You can pray alone and fast alone. ...But you can't take Communion alone. More than any other practice, taking Communion forces us to be with others..." (12). Also, I really like her threefold division of "waiting," "receiving," and "afterward." On waiting, she writes, "Part of waiting to take Communion is examining how we have been like the citizens of Sodom and Gomorrah, how we have been drawn into the empire's kingdom (how we have sinned) and at the same time, to check in on how we have been like the citizens of Jesus' kingdom of God" (34). That latter part is a healthy corrective to the overly somber times of reflection that result in nothing other than personal guilt trips. In summary, "[P]art of waiting...is examining what we did last week to find the kingdom of heaven in our midst and to help others find it" (37). On receiving, she makes a nice observation about our cultural situation. She says that, "Even when seeking words for rest, we use phrases like refueling or recharging, more appropriate to machines than to persons" (42). Her instruction for receiving is simple: open your hands [to receive the bread and cup]." In so doing, she writes, "we would have done two-thirds of what needed to be done. Which is to admit that we simply do not have all the answers; we simply do not have all the power" (45). But oddly, in my estimation, she takes a strange turn at the end of the chapter on this action and says that "Faith is a catch-and-release sport. And standing at the altar and receiving the bread and wine is the release part" (46). That makes no sense at all because she just spent the whole chapter talking about "receiving," not "releasing." 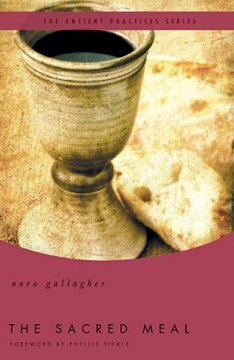 On the time following the reception of the Eucharist, which she dubs "afterward," Gallagher writes, "[W]hatever happens during Communion, one of the ways to spend the immediate time afterward, after coming out of the experience, is to sit in silence and let it seep into your cells" (56). This sacred meal, the Lord's Supper, is more than a remembrance and more than a memorial. It is a meeting and merging of the human and the divine. That intersection is transformative because, "Transformation occurs in encounters, sometimes better named collisions, either with the self or with others or with the holy" (60-61). That is the kind of interaction happening in the eucharist - whether it's called "mass," "communion," "Lord's Supper," or something else. Beyond that tripartite scheme of waiting, receiving, and afterward, it seems to me that the author ventures into theological waters that are over her head. She attempts to shed light (but falls short of actually doing so) on the long-standing debates of "Real Presence" in the meal and what exactly is transpiring during the ceremony and in the elements of bread and wine. In closing, the book is an adequate introduction to meal of which all we can say is, "The body of Christ, the bread of heaven. Receive and eat. The blood of Christ, the cup of salvation. Receive and drink." And strangely enough, that is sufficient.